COUNTY Down will be buzzing again on the Twelfth as Orangemen and women don their sashes and march behind their lodge banners. The south Down coastal venue of Dundrum will stage a picturesque Twelfth parade for the first time in over 10 years. The village, which last hosted such a demonstration in 2002, is expected to attract large crowds in excess of 8,000 people, both participating and spectating. Almost 70 lodges and 40 bands will take part in the celebrations. 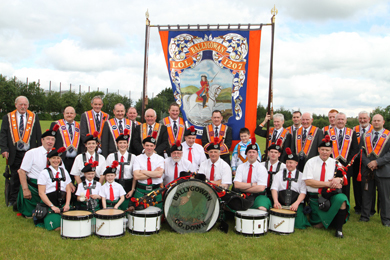 The Ballygowan Pipe Band with LOL 1207 in Ballynahinch in 2012. A total of five districts will be represented – Comber, Saintfield, Lecale, Ballynahinch and Castlewellan. The procession will move off from the assembly field at 12.15pm headed by the host district – Castlewellan District LOL No 12 – and County Officers, who will be followed by brethren and sisters from the other districts on parade. The parade incorporating a two-mile route will proceed through the village via Main Street, leading to the demonstration field at the Old Road (Newcastle side). A religious service will be held at 2pm, where the guest speaker will be County Down Grand Master, Victor Harrison. Ahead of the Twelfth demonstration, Castlewellan District will host a ‘Fun Night’ at Dundrum Orange Hall on Wednesday 10 July. The family orientated event, which commences at 7.30pm, will include an exhibition, food and music. The stunning backdrop of the Mourne Mountains and the Irish Sea provide the perfect setting for this year’s Twelfth parade in Annalong. Jack Orr of Ballykilbeg LOL 1040 with drummer boy William Edgar of the Johnston Memorial Flute Band in 2012. One thousand Orangemen from the Mournes, representing the largest district in the Grand Orange Lodge of Ireland, will step out in the County Down seaside village. Despite being one of the smaller demonstrations, Mourne District can also lay claim to the biggest individual private lodge on parade, with Ballyvea LOL 343a boasting 148 members. Fourteen of the 15 Lodges will be accompanied by their own bands, adding to the family atmosphere on the day. Kilkeel Lodges will leave Kilkeel Orange Hall at 10.45am and walk the five-mile route to Annalong. They will meet their fellow brethren near Anthonys Road (outside Ballymartin) at 11.30am, before the entire District parades through Annalong to the demonstration field. Following refreshments, the platform proceedings are due to commence at 2.15pm. The guest speaker will be Rev Bobbie Stevenson, a Presbyterian Minister and member of Mourne District. Both Derryogue LOL 424 and Ballymageogh LOL 1036 will have new banners on display. Members of Cranfield LOL 907 will also be carrying their banner – marking the local area’s links to the Second World War – which received a runner-up award at the Orange Community Awards earlier this year. The District will leave to commence the homeward parade at 4pm. Annalong is hosting a Twelfth demonstration for the first time since 2009. The 2013 Twelfth celebrations in the capital city will have extra special significance as the County Grand Orange Lodge of Belfast celebrates its 150th anniversary. As is traditional, the parade will leave Belfast Orange Hall, at Carlisle Circus, at 10am. The Millar Memorial Flute band will head the procession, leading County Grand Lodge officers and guests, as it makes its way along Clifton Street, Donegall Street, Royal Avenue, Castle Junction and Donegall Place to Belfast City Hall. A wreath laying ceremony will take place at the Cenotaph in the grounds of the City Hall as members of the Orange fraternity remember the sacrifice of those who served in two World Wars and in the line of duty throughout the Troubles. At approximately 10.40am and following the act of remembrance, Orangemen and women representing a total of nine districts, accompanied by approximately 70 bands, will then proceed via Donegall Square West, Bedford Street, Dublin Road, Shaftesbury Square, Bradbury Place, Lisburn Road, Balmoral Avenue and Malone Road to the demonstration field at Barnett Demesne. Thousands of spectators are expected to line the six-mile route, including many visitors from overseas, experiencing in person the colour and pageantry of the Belfast Twelfth. As part of this year’s Orangefest, an initiative of the County Grand Lodge of Belfast and Belfast City Centre Management, shops in the city centre will once again open at 12 noon when the parade has passed through the city. They will close at 5pm. The large crowds in attendance can also enjoy on-street entertainment and avail of a mini market, featuring cookery demonstrations by some of the Province’s best food producers, on the lawns of the City Hall. Platform proceedings are due to commence at 2.45pm and the chairman for the afternoon will be the Deputy County Grand Master, Spencer Beattie. Resolutions will be read by Belfast County Grand Master, George Chittick (enjoying his first Twelfth as the city’s most senior Orangeman) and Past Grand Master of the Grand Orange Lodge of Ireland, Rev Martin Smyth. To mark its milestone year, Belfast County has produced an informative anniversary booklet recounting the history of the Loyal Institution in the city. In addition to hosting a formal dinner at Belfast City Hall, a commemorative plaque was also unveiled at Clifton Street Orange Hall in May. In a new initiative, the City Hall will be illuminated Orange and Purple as dusk settles over Belfast, offering a suitable visual backdrop against the landmark building to end this year’s Twelfth celebrations. The Duke of Schomberg, King William’s second-in-command, along with his army arrived in nearby Groomsport to pave the way for King William III to cross the sea from England ahead of the Battle of the Boyne in 1690. King William himself will be in attendance at the popular seaside resort as the North Irish Dragoon Society Equestrian re-enactors, dressed in period costume, bring history to life as part of the North Down Combine demonstration. William will do battle with his old adversary, King James, at the head of the parade providing a unique spectacle to the many onlookers. Approximately 40 lodges, representing Newtownards, Holywood, Upper Ards and Bangor Districts – will be on parade accompanied by a similar number of marching bands. Prior to the main procession, members of Bangor District will participate in a short parade through the town centre, leaving the Orange hall on Main Street at 10.30am. Brethren will then make their way to Ward Arras where they will meet with the other three districts for the main parade. At noon, the procession led by Newtownards District will move off from the Gransha Road and parade the three-mile route via Castle Street, Hamilton Road, Savoy Corner, High Donaghadee Road, High Street, Abbey Street, Newtownards Road and Abbeyhill Drive to the Valentine playing fields. The guest speaker at the demonstration field will be the Deputy Grand Master of the Grand Orange Lodge of Ireland, Rev Alastair Smyth. Among the participants on the day will also be Jim Todd, a past Grand Master of the Orange Institution in Australia. A collection will be taken along the parade route and at the field in aid of Marie Curie Cancer Care. Members of the Orange Institution will follow in the footsteps of King William when they parade to the demonstration field in Loughbrickland. Over three centuries ago, the County Down venue was the rendezvous point for King William’s troops who had dispersed in winter quarters on their way to the Battle of the Boyne. A large stone marks the Army’s camp location on the outskirts of the village. Upwards of 100 lodges and 80 bands are expected to take part in the demonstration, which is typically one of the larger parades in the Province. Eight districts will be on parade – Lower Iveagh, Rathfriland, Banbridge, Lower Iveagh West, Bann Valley, Gilford, Newry and Loughbrickland. Orangemen, joined by members of the Ladies Association and Juniors, will leave the assembly field on the Legananny Road at 12 noon and parade through the village via Scarva Street, Main Street and Dublin Road, under the A1 dual carriageway, to the demonstration field on the Grovehill Road. Among the dignitaries on parade will be African Orangeman Foli Bruce, who is a former Grand Secretary of the Loyal Orange Lodge of Togo. He will be joined on the platform by Drew Nelson, Grand Secretary of the Grand Orange Lodge of Ireland, and Samuel Walker, Deputy County Grand Master of County Down, and other senior district officers. A special tribute by Drumlough Heroes LOL 153 (Rathfriland) marking the centenary last year of the sinking of the Titanic will also be on display. Their bannerette was painted in honour of a Past Master of the Lodge – Thomas Rowan Morrow – who was the only third class passenger from Ulster to perish onboard the famous vessel in 1912. The south Down Lodge won the Best New Banner Award at this year’s Orange Community Awards. The parade marks the culmination of the Twelfth celebrations in the village following a week-long community festival. The activities organised by the Loughbrickland and District Rural Development Association commence with a Grand Fete, including a fireworks display, in the demonstration field on July 6. Other events include a treasure hunt, a historical re-enactment, a workshop looking at the influence of Scottish settlers in the area and an open air Songs of Praise. The return parade, following the religious service, is due to leave the field at 4pm and will proceed via the Dublin Road and Main Street to the Banbridge Road prior to dispersal. 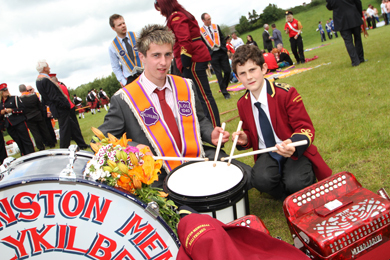 The Twelfth was last held in Loughbrickland in 2005. This year the UK City of Culture for 2013 will host the flagship Twelfth demonstration, the Orange Order has confirmed. The Twelfth in Londonderry has been chosen, in this a showcase year for the Maiden City, to provide an enhanced cultural experience as part of the biggest annual festival in Northern Ireland. 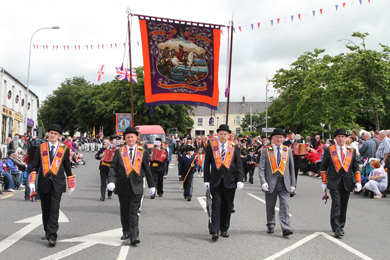 Londonderry will stage one of 18 demonstrations planned across the Province on July 12, all of which follow the traditional Rossnowlagh parade held in the Republic on the preceding weekend. Orange Order Director of Services, Dr David Hume, said: “We are delighted that Londonderry will be the flagship tourist Twelfth of 2013 in what is a very special year for the city. The fact that this will be the only flagship of 2013 highlights the importance which the Grange Orange Lodge of Ireland places on the UK City of Culture status which has been accorded to Londonderry and Northern Ireland. 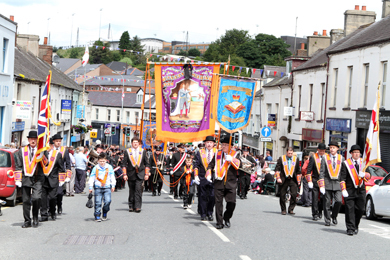 “The organisers of the Twelfth in Londonderry are offering a varied festival and their demonstration takes place in one of the most historic venues in Ulster. Tourism Minister Arlene Foster said: “The Grand Orange Lodge of Ireland’s announcement that it is to host its flagship Twelfth demonstration in Londonderry as part of the UK City of Culture programme is welcome news. “This year offers unprecedented opportunities for tourism in the North West and I have no doubt that the flagship Twelfth demonstration will attract a large number of visitors to Londonderry. The flagship concept focuses on broadening the appeal of parades to attract a tourism audience and I know those involved in the demonstration will provide a varied and vibrant programme of events for visitors to enjoy. The three most senior Orangemen in the British Isles will be in attendance at the flagship Twelfth demonstration in Londonderry. Grand Master of the Grand Orange Lodge of Ireland, Edward Stevenson; Grand Master of the Grand Orange Lodge of England, Ron Bather; and the Grand Master of the Grand Orange Lodge of Scotland, Henry Dunbar, will all be on parade in the Maiden City as it revels in its showcase year as UK City of Culture for 2013. The 323rd anniversary of the Battle of the Boyne celebrations in the North West will provide a fitting finale to the Orange Order’s extensive programme of free cultural events marking Londonderry’s twelve months in the world spotlight. Upwards of 10,000 spectators are expected to enjoy the festivities with the numbers watching swelled by holidaymakers staying on the north coast, seeking to witness the spectacle of an Orange parade in the historic city. City of Londonderry Grand Orange Lodge officers will be accompanied on parade with a new hand painted banner and will also wear new collarettes commemorating the city’s UK City of Culture status. The new regalia were dedicated at St Columb’s Cathedral on July 7. At 10am, senior Londonderry brethren – joined by the visiting Grand Masters – and members from two City of Londonderry Districts will parade from the headquarters of the City of Londonderry Grand Orange Lodge (Apprentice Boys Memorial Hall) to their assembly point at May Street in the Waterside. The route of the morning parade will be Society Street, Bishop Street, Diamond, Ferryquay Street, Carlisle Road, Craigavon Bridge, Spencer Road, Clooney Terrace, Glendermott Road, Bonds Street and May Street. Approximately 60 lodges representing the districts of City of Londonderry, Raphoe (Co Donegal), Coleraine, Limavady, Macosquin and Claudy will participate in the main demonstration. Members of the Ladies Association and Junior Lodges will also take part in the parade. They will be accompanied by over 40 bands. King William and Mary will create an historic atmosphere in the city associated with the famous siege of 1688-1699 as they walk through the streets of Londonderry and lead the main procession. The main parade will depart from May Street at 12 noon sharp and proceed through the walled city via the Limavady Road, Dales Corner, Clooney Terrace, Spencer Road, Craigavon Bridge, Carlisle Road, Ferryquay Street, Diamond, Bishop Street, London Street, Hawkin Street, Kennedy Place, Kennedy Street, Wapping Lane, Craigavon Bridge, Spencer Road, Clooney Terrace, Glendermott Road, Bonds Street, May Street and Limavady Road, to the demonstration field at Wilton Park. The platform proceedings will be conducted by the City of Londonderry Grand Chaplain, Rev Ivan Dinsmore, and following the religious service, the main speaker will be the Grand Master of the Grand Orange Lodge of Ireland, Edward Stevenson. The parade will leave the demonstration field at approximately 4.30pm. As part of the Flagship process, a number of “Welcome Hosts” will ensure that everyone attending the celebrations will be kept well informed as to what is happening on the day, especially those who are visiting the city for the first time. They will be moving around and through the crowds, offering advice and assistance, and distributing literature relevant to the day itself. The Twelfth demonstration marks the culmination of the City of Londonderry Grand Orange Lodge’s UK City of Culture 2013 cultural programme, which commenced in April. The wide spectrum of events included a specially commissioned theatre-in-education production, The Billie Girl; a lecture series and a festival day at Willton Park.